Government in the United States includes the understanding of three terms: Self-government, sovereignty, and social compact. Sovereignty is the inherent and independent right to do all that is necessary to govern oneself. In the United States, the People are sovereign. In fact, only the Individual is truly sovereign because only the people, and not government, have inherent rights to Life, Liberty, and Property which they also have the right to protect and preserve. In the United States, we enjoy self-government; that is, government originates from the people, for the people – “of the people, by the people, and for the people.” Government arises out of social compact. In other words, because Man is a social creature, he forms together into communities. And in order that communities run smoothly and common services be provided to protect everyone’s rights and property, governments are instituted. And so, individuals delegate some of their sovereign power of self-defense and self-preservation to a government. That is why the bulk of government is always supposed to be closest to the individual, where it is most responsible and most accountable. Our rights and liberties are most protected when people have the frequent opportunity to see their elected officials and look them in the eye and when those officials see a personal story behind acts of legislation, etc. This is exactly what our Declaration of Independence tells us about our Individual Sovereignty. In the first paragraph, we are told that our sovereignty is based on Natural Law and God’s Law – “to assume among the powers of the earth, the separate and equal station to which the Laws of Nature and of Nature’s God entitle them.” The only rightful power our government has is the power that the People – by the consent of the governed and according to the precise language and intent of our Constitution – have temporarily delegated to it. In that grant of power, in a system based on the Sovereignty of the Individual, there is always a mechanism to that power back. That is why the Declaration explicitly states that the People have the right to “alter or abolish” their government (when it become destructive of its aims). In fact, that right is so important and so fundamental, it is listed with the other inherent rights that individuals possess. 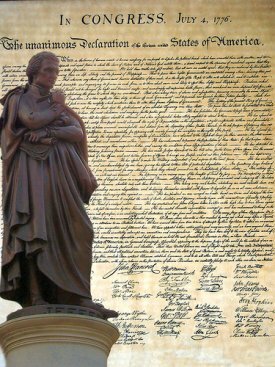 In other words, what the Declaration is saying is that the People of the “united States” have the right to reclaim the sovereign power that they temporarily delegated to that government to govern and protect their liberties. If, on the other hand, in that grant of power there is no longer a mechanism to take it back, then the People are no longer sovereign. If the government tells us that we don’t have the right, or the power, to take it back, then we have already lost our freedom and our system of government is no longer based on the sovereignty of the individual. So, next time you hear people profess the opinion that the Supreme Court has given the final word on efforts to reclaim sovereign power, ask yourself: “Are they on the side of Liberty or Tyranny” ? Nullification is an ESSENTIAL first step in reclaiming power that the government has unilaterally and inappropriately usurped from us! This entry was posted in Uncategorized and tagged compact theory, Constitution, Cooper v. Aaron, Declaration of Independence, God's law, government, inalienable rights, individual sovereignty, Justice Scalia, Liberty, Natural Law, natural rights, nullification, nullify, Salmon Chase, secession, self-government, social compact, sovereign, sovereigny, Supreme Court, Texas v. White, Thomas Jefferson, tyranny. Bookmark the permalink. Pingback: Where are Today’s Sons of Liberty? | Nullify Now!